What are the benefits of signing up for a Toll Tag Account? Having a Toll Tag in your vehicle is so much better than not having one. We all know the hassle of scrambling for change, sitting in toll traffic or missing a payment deadline. Once you’ve registered and are fitted out with your brand new Toll Tag, you’ll not only make great time but you can save money on your toll journeys too. Where can I get a Toll Tag? What information do I need when signing up? To sign up for a Toll Tag Account, you’ll need your full vehicle details and a valid payment method. When you sign up for an account you will never again have to worry about missing next day payment deadlines or having the right change as you approach a toll plaza. A post-paid account allows you to set up an account to pay the toll charges at the end of the month when the journey was taken. Payment dates can vary depending on the Toll Tag Provider. With a pre-paid account, you can top up your account before you use the toll. And even if you forget to top up, your account will automatically be topped up, should your account dip below the specified minimum level. A cash account allows you to top-up your toll tag with credit using cash payments before you travel. Similar to the way you’d add credit to your phone. You can do this at any PostPoint outlet or OmniVend kiosk in Ireland. How do I install a Toll Tag? Installing a Toll Tag is super easy…once you know how! In cars and people carriers, tags should be installed horizontally on the inside of the windscreen behind the rear view mirror. On vehicles with heated or athermic windscreens, the tag must be placed behind the rear view mirror in the centre of the shaded/dotted area. In the case of a bus, lorry or truck, the tag should be placed vertically at the bottom centre of the windscreen. Check out our tag installation guide which offers a visual explanation of how to install your Toll Tag. What if my Toll Tag doesn’t work? If your tag isn’t working, please ensure that your tag is positioned correctly. In cars and vans, it should be high up and centred on the windscreen, below the rear-view mirror. In trucks and buses, it should be low and centred on the windscreen. Please find our guide to installing a tag here. You must stay within the express lane speed and distance limits. The majority of tolled roads in Ireland apply a speed restriction of 50km/h. Drivers also need to maintain a distance of at least 30 metres from the vehicle driving in front of you. Should you break these restrictions, the vehicle will be rejected from the express lane. Tags may stop working if an account has been suspended. Billing issues may cause account suspension. If this is the case, you will need to contact your tag provider directly to update your payment details or payment method in order to reactivate your tag. If your tag still isn’t working after completing these steps, it is possible that the battery has expired. The standard battery life of a tag is between 3-5 years dependant on usage. Please contact your tag provider directly regard replacing your tag. Some older model tags have not been working at toll plazas. If you have the larger model tag and it is not being automatically read at the toll plazas and the cashier in the toll booth has been manually entering your tag please contact your tag provider. You will be issued with a new slim line tag as soon as possible. How can a Toll Tag Account benefit my business? It makes perfect sense to have a Toll tag account for your business. Who is responsible for maintaining my Toll Tag? You, the account holder, are responsible for maintaining your Toll Tag and, if the account needs to be closed, you’ll need to be return all Toll Tags in an acceptable condition. It’s also your responsibility to report lost/stolen/damaged Toll Tags to your tag provider. If your Toll Tag is not being read automatically, or you have to hand the tag in at the toll booth to register your transaction, you should report the issue immediately to your tag provider. Please refer to your tag provider’s terms and conditions for more information. What is the Electric Vehicle Tolling Incentive (EVTI)? When you use one of the country’s toll roads, you’re required to pay a toll. Transport Infrastructure Ireland (TII) has responsibility for overseeing the implementation of tolling throughout Ireland. In addition, the Authority also has responsibility for planning, supervising, constructing and maintaining all national roads in Ireland. Transport Infrastructure Ireland is empowered by the Local Government (Toll Roads) Act, 1979 to charge and collect tolls for the use of certain roads by vehicles. Major new road developments in Ireland are now undertaken and funded through Public Private Partnership (PPP). This means, that in order to develop new roads and maintain current infrastructure, part of the funding required comes from public sources and part comes from private commercial sources. Transport Infrastructure Ireland's use of PPP projects is in accordance with the strategy of using tolling to recover part of the substantial private sector investment involved in developing and maintaining roads in Ireland. eToll is the symbol for electronic tolling in Ireland. It is a trade mark and can only be used on services with the permission of eToll and Transport Infrastructure Ireland. eToll aims to increase the awareness of, and demand for, electronic tolling accounts in Ireland. There are eleven toll roads in Ireland. This includes both standard toll plazas and the barrier-free M50 toll in Dublin. Toll Tag Accounts from tag providers who are eToll registered companies are interoperable. This means that the same tag can be used to pay toll charges on any toll road in Ireland. How do Toll Tags work? A small electronic tag is placed in your vehicle and is detected each time the vehicle passes through the plaza. The toll is then debited from your account. The system will automatically recognise the correct toll for the class of vehicle you are driving. Currently only the electronic tags provided in Ireland by tag providers will work on Irish toll roads Full integration for tag providers across Europe will be available in the future. What does eToll interoperability mean? Most Tag Providers use the eToll Interoperability system which means a driver will only need one tag for tolling facilities in Ireland. We recommend that only one tag should be installed in each vehicle. Drivers with more than one tag need to be aware that only one tag will be read through random selection. Therefore, it is advised that drivers choose a preferred tag to be placed properly within their car. I ride a motorcycle, can I get a tag? Tag providers don't supply tags for use by motorcyclists at toll plaza express lanes. Toll plaza operators have also advised that the express lanes are not designed for use by motorcycles. Due to this potential safety hazard, we do not recommend using a Toll Tag with a motorcycle. Which roads in Ireland have a toll? If you have any further queries in relation to this adjustment please contact Dublin City Council who operate the Eastlink Toll Bridge. Will other European tags work in Ireland? Currently only the electronic tags provided in Ireland by tag providers will work on Irish toll roads. Full integration for tag providers across Europe will be available in the future. How do I report a motorway incident? There’s a dedicated motorway incident line that you can call if you see an incident on a motorway in Ireland. Simply dial 0818-715-100 or email operator@nraits.ie. How do I pay for a toll in Ireland? 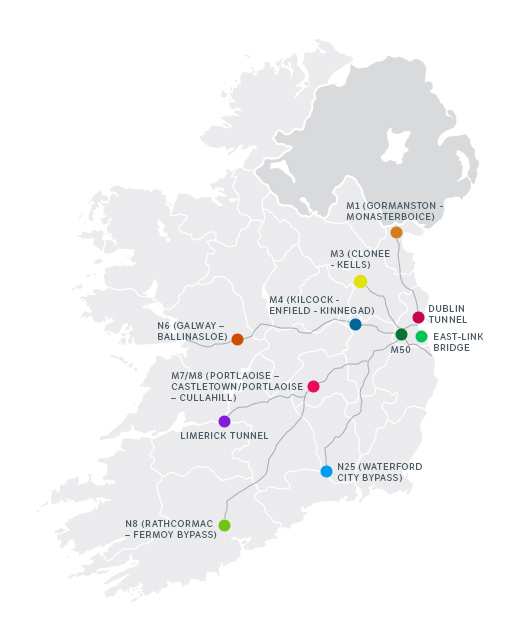 Ten of Ireland’s eleven toll roads have conventional barrier toll plazas. Unless your car has a Toll Tag issued in Ireland, you’ll need to stop at the cashier’s booth and make a toll payment in cash. Dublin’s M50 toll plaza is barrier-free and you can pay online here. Or you could make your life a little easier and sign up for a Toll Tag Account now and skip the hassle of toll booths altogether. How much does a toll cost? Toll charges vary depending on the road you’re travelling on, the type of vehicle you have and whether or not you have an account with a tag provider. View the rates page which gives a detailed breakdown on the various tolls. Who is exempt from paying tolls? There are a number of drivers who are exempt from paying tolls. Vehicles belonging to and used for official purposes by the Defence Forces, An Garda Siochana and vehicles used by the emergency services are exempt from paying tolls charges in Ireland. Specially adapted vehicles driven by disabled persons are also exempt from tolls on each toll road in the state. What if I arrive at a toll with no money? If you arrive at a toll plaza without money, you will be required to sign an “Unpaid Toll Report” sheet. Failure to pay a toll is an offence. Users can pay their unpaid toll charges with cash or card at any toll booth. When using the barrier free M50 toll road without an active tag, payment should be made before 8:00pm the following day to avoid an additional charge of €3.00 being applied to the original toll. All motorists who use one of the country’s toll roads are liable to pay toll fees. Those who use a toll road and then fail, neglect or refuse to pay are guilty of an offence and liable on summary conviction in a District Court to a fine not exceeding €5,000. But you won’t have to worry about this if you have a Toll Tag Account! How do I pay for tolls if I’m driving a rental car? You should get in touch with your car rental company in advance to find out if your rental agreement covers the payment of toll charges. If this is not the case then you are responsible for the payment of toll charges. What happens if I don't pay my M50 Toll? If you don’t make an M50 toll payment before the 8pm the next-day payment deadline, you will incur an additional charge of €3.00. If the original unpaid M50 toll charges and the penalty are not paid within 14 days then an additional late payment penalty of €41.50 will be incurred. Failure to pay this outstanding amount after a further 56 days will result in an additional late penalty charge of €104.00. If you have still not paid the amount due, legal proceedings may be initiated. Euro Parking Collections is licensed to collect unpaid toll charges on behalf of the M50 across the European continent. To avoid all this hassle, you can sign up for a Toll Tag Account and even save up to €1 on your M50 journeys! Why are toll charges imposed? What happens if I don’t make an M50 toll payment? Failure to pay this outstanding amount after a further 56 days will result in an additional late penalty charge of €104.00. If you have still not paid the amount due, legal proceedings may be initiated.